A last outfit post from New York but not the last post from there. On the 3rd day of our trip we decided to take a walk on Brooklyn Bridge, a place that both love. We then visited Guggenheim Museum where we saw Picasso's black and White art, an impressive collection of drawings and paintings, and once again went shopping in home decoration department at MOMA store. The days are flying so fast when you have a great time but in the same time we were glad to come back home to spend Holidays with our loved ones. Love these photos..amazing! The ones are the bridge are fantastic..glad you had a such a wonderful time! You look really cool! love your jacket. so cute darling! and i like the entire outfit! wow, these pictures are incredible! lovely outfit! the third photo on Brooklyn Bridge is GORGEOUS! Oh the mustard and red accents are gorgeous!!!!!!!!!!! These photos and the entire atmosphere evokes a Vogue editorial and what can I really say than marvel at your beauty and natural charm! :) Hope you’re enjoying your holidays to the most my dear! you are amazing, full of colours as always, but the background is fantastic!!! AMAZING, you look AMAZING as usual ! L O V E THE BAG!lOVELY SUNGLASSES,LOVELY GIRL! i love your pictures! and i love your coat! Present for Christmas : http://salutlesfashions.tumblr.com/post/38984395977/26 I hope you’ll take with smile. Adore your look. I as absolutely fabulous!!! Love your coat! In Brazil we are enjoying the summer so It is too hot to wear now hahaha but I loved anyway! missing NY soo much..lucky u! I love all your New York pictures! You look absolutely great! You look amazing! 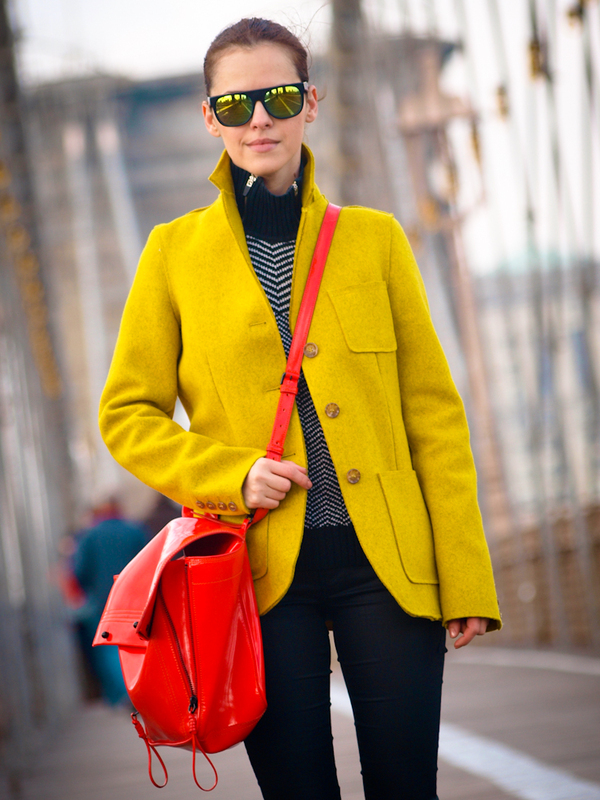 I love the combination between the mustard-ish coat and the red bag. Wonderful photos as well. so cool! love this color combo! Awesome .. Superb.. What an amazing stylish wear..! !